When the owner of a five-star rated Tasmanian Airbnb purchased the property in 2017, she never expected what would happen next! Three Beaches is close to Eggs and Bacon Bay Beach, Randalls Bay Beach and Mickeys Beach in Tasmania’s Huon Valley. Its proximity to these three beaches is how the owner came up with the name; Three Beaches. What started as an unloved shack was transformed into an inspiring Airbnb Tasmania retreat, receiving rave reviews from guests. Property owner Cherie Stewart has already become one of Airbnb’s Super Hosts and a preferred partner on Booking.com. Three Beaches is the first Airbnb property in Tasmania invited into the Airbnb Plus program, designed to recognise the best curated and designed homes with top guest hospitality. Many guests love the back yard and especially the bean bags which are an essential element that gives the space a point of difference. Guests specifically mention the bean bags, which have been a massive hit with kids. Guests from all over the world have stayed at the property, including Finland, China, USA, Taiwan, Singapore, England, Japan, Italy, Hong Kong, Germany, Canada and even locals from nearby Kingston. In less than five months the property has hosted over two-hundred guests. The home was seven years old when the current owner purchased it. Since buying the property in 2017, she has doubled its value with a cosmetic renovation. She recently had the opportunity to participate in Airbnb Tasmania’s Open Homes program. The program allows Hosts the chance to offer their homes to the local community displaced by disasters such as the recent Tasmanian bushfires. Surrounded by stunning scenery, you will find the chic residence a moment from the beach in Tasmanian Foodies Paradise; the Huon Valley south of state capital Hobart. Situated on a quiet street, guests enjoy the tranquillity and privacy of the sun-drenched landscaped outdoor living area. Features of the fully enclosed outdoor space include a sandpit for the kids, fire pit, outdoor shower and a barbecue. Inside the home, there’s a gourmet kitchen, study-nook, beds with luxurious pure Australian cotton sheets and all the creature comforts to ensure guests feel like they are at home. The kitchen features stainless steel appliances, an espresso coffee maker, a selection of local Tasmanian tea plus unique spice ingredients like native Pepperberry and Kunzea salt. The bathroom helps guests breathe in the Tasmanian experience with pampering shampoo and body products made with pure Tasmanian essential oils. “We wanted our guests to soak up Tasmania with every sense and our Pure Oils of Tasmania body products made on the Tasman Peninsula just outside of Hobart, gives people Tasmanian Kunzea, Manuka and Lavender Tea Tree oil scent experiences you can’t find anywhere else”. Guests receive complimentary Wi-Fi, USB charging points throughout the home and outside, Bluetooth speakers and Google Home. Owning the Instant Hotel has allowed Cherie to meet exciting people from around the world while giving her the rewarding feeling of being able to create a unique experience for guests. Some more memorable moments include celebrating a couple’s first anniversary, providing a surprise birthday gift weekend away and special family gatherings. “Quite a few people are bringing their parents to spend quality time together and explore the beauty of the local area. This seems to be a relatively new Airbnb Tasmania travel trend”, says Cherie. Revenue has been both consistent and healthy for this first time Airbnb owner. Owners of these types of properties can enjoy income four times that of permanent tenants and still have some time in the home themselves or have family and friends to stay. Three Beaches’ owner is passionate about ensuring her guests have a memorable stay. Part of this process is to provide a range of locally sourced welcome gifts. “Our guests often say they feel at home the moment they step into space,” said Cherie. “We leave people fresh local orchard apples, Tasmanian chocolates, a hand-written welcome note and lots of thoughtful touches to delight. If kids are staying, we leave out some cute toys and change the bedroom décor with the simple addition of some cuddly animal shape pillows”. 1. Use outdoor bean bags for extra comfortable outdoor seating. 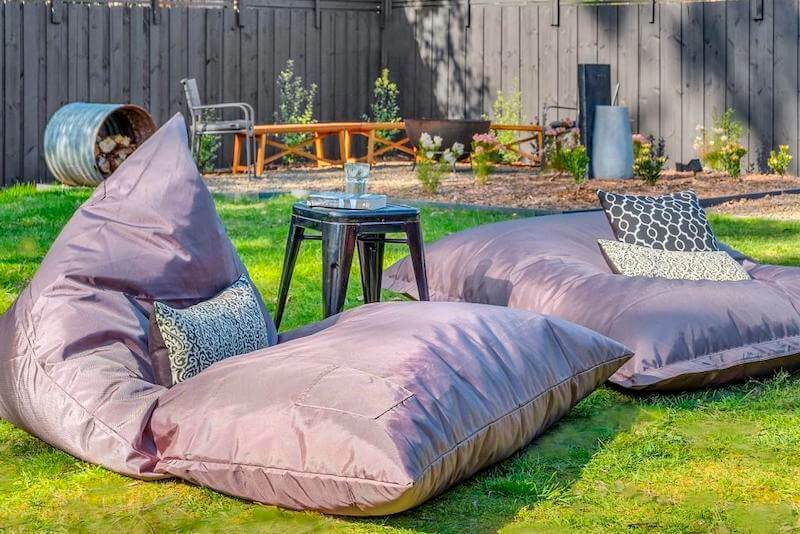 Waterproof outdoor bean bags are great for grassed areas and large patios or decks and will weather all outdoor conditions. Guests will enjoy the support and relaxation benefits only beanbags can provide, and they can be used flexibly inside the home. Choose a colour scheme that complements the surrounding terrain and the finishes of the house. 2. Create separate seating areas for adults and children so each group can have a break from the other. Kids will enjoy having their area and parents will appreciate some downtime. 3. Make sure there are plenty of shrubs and plants to add greenery to your outdoor spaces. Palm trees create a tropical resort feel in any climate. Screening shrubs like Pittosporums along a fence line are fast growing, can hide the fence and provide added privacy to your yard. 4. Make sure your outdoor space is clean and inviting. Regularly mowing the lawns, removing leaves, weeds and debris will improve your guests’ experience. An outdoor rubbish bin or covered ashtray if you allow smoking, will encourage guests to keep the area tidy. 5. Provide hard and soft seating areas. Some adults may require the support of a chair, especially around the outdoor dining table. Bench seats are a great way to encourage guests to mingle. A mix of outdoor lounges, bean bags, sun lounges, hanging chairs, benches and ottomans will give people plenty of relaxation choices. 6. If it’s safe to do so, consider using a fire-pit. There’s nothing quite like an open fire at night, especially in cold climates. Remember to keep some firewood, kindling, gas lighter and fire starters handy. 7. Water features not only look good; the flowing water creates a soothing ambience, and many have inbuilt lights to bring the space to life at night. Water features are easy to find and install these days and are prevalent in short term rental properties throughout Australia and Asia. 8. Make sure your garden is well watered. Lush green lawns and plants are inviting, but dead lawns and unhealthy plants are not going to attract the guests you want. 9. Include luxury touches – well-stocked ice cube trays, champagne flutes, cold water infusion tea bags next to a glass water pitcher, plush towels, botanical essence bathroom products, cheese knives and rustic serving paddles do not cost a lot of money but make the guests feel pampered and special. 10. Include some technology that people would not usually get to try at home. Three Beaches guests love experimenting with Virtual Assistant Google Home which lets people use voice commands to ask her to play their favourite music, tell them jokes, find recipes, give them the latest weather, news and sports results, play games, play videos on TV and even give them compliments whenever needed! The Huon Valley is famous for its agriculture, with eighty-three per cent of Tasmania’s apples grown here. It is also a significant producer of pears, cherries, seafood and timber including the famous Huon Pine. Home to Australia’s most southern town, the Huon Valley was first settled in the 1820s by Hobart based British colonists looking for timber. There are many tourist attractions including wineries and boutique cider houses, limestone caves, unique marsupial wildlife, stunning bushwalks and hiking, boating and fishing, Aurora Australis or Southern Lights sightings, restaurants and gourmet food experiences, galleries, museums, natural therapies, handcrafts, homewares and gift shops, making the area popular with visitors. The three beaches that help make the Huon Valley famous are Eggs and Bacon Bay Beach, Mickeys Beach and Ninepin Point Beach. Each of these has a fascinating history. Eggs and Bacon Bay Beach is just four hundred metres long and three hundred metres deep. The beach gained its name from the yellow and red streaky egg and bacon flowers that grace the shoreline and are home to Kookaburras and the blue-headed Superb Fairy Wren. This beach is a favourite place for a picnic lunch. Mickey’s Beach is secluded and accessible by a fifteen-minute cliff-top walk from Randall’s Bay Beach. It is also accessible by car, and there is parking available. Just a one-hour drive from Hobart, Mickey’s beach offers a romantic setting for couples. Ninepin Point Beach at Verona Sands is perhaps the most picturesque and features beautiful white sand and some incredible views across the D’Entrecasteaux Channel, the three islands; Bruny Island, Huon Island and Satellite Island as well as the Hartz Mountains which are snow-capped in winter. A regular dolphin spotting site, Ninepin Point Beach is popular with Kayakers, and there is a launch point at the western end of the beach. Families enjoy using the picnic tables, BBQ area and available public toilets. Founded in 2008, Airbnb Inc. based in San Francisco, changed the way travellers book accommodation, making private homeowners instant hoteliers through their app and website. Unlike traditional hotels, Airbnb does not own any property; it merely facilitates the booking and receives a commission for each transaction. In 2012 Airbnb established itself in Australia, building an office in Sydney. In 2016 Airbnb’s Sydney location is considered one of the coolest offices in the world. Instant Hotel is an Australian based television reality show produced by the Seven Network and first aired in November 2017. The program features teams of Australian property owners who rent their homes on Airbnb; each group stays at each others’ homes and rates their experience. The winner receives $100,000 in prize money. The first two seasons of Instant Hotel proved popular and provided some great tips for anyone who owns an Airbnb property or is thinking about starting their own Instant Hotel. Founded in 2011, Bean Bags R Us specialises in the manufacture of outdoor beanbags. The range of products now exceeds two-hundred different items. Bean Bags R Us is the preferred choice of beanbag furniture for many of the world’s leading resorts. At Three Beaches, guests enjoy the Bermuda Triangle and Hayman outdoor beanbags in charcoal grey. You can click here to discover our exclusive range of outdoor beanbags.